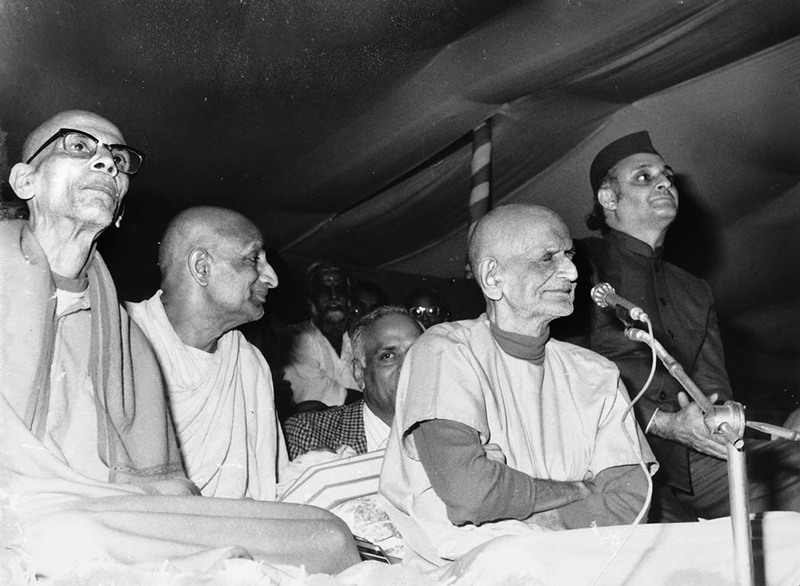 Swami Chidananda Maharaj gave the following speech as the Chairperson for the day’s Ved Sammelan during the ten days -long Birth Centenary Celebrations of Pujya Swami Gangeshwaranandji Maharaj Udaseen. Duty is higher than emotions and I would like to explain that. Till such time that the people of this country revere and respect the Sadhu Samaj the prosperity of this country, Bharat Mata is assured, and its future is secure and Mangalmay ( auspicious) . God has given us Buddhi ( discerning intellect ) and Vichar ( the ability to think and contemplate ) along with Emotions. Where the Buddhi should be applied if Bhavana or emotions are used then there surely will be problems! ( Gadbad ). In the same way when we need to use our emotions and if we start to use our Buddhi then too everything will be in a chaos. Ved Bhagwan were in a Formless state and in the Avyakta and AdrishyaRoop, but the Gurus through their Shri Mukh have passed on this legacy by listening, contemplating and then storing it in their memory and passing it on to every generation. This way each generation received the great teachings from their Gurus. Traditionally Ved Bhagwan is Avyakta ( formless ) and not available in the written form , but were brought to us in the WRITTEN FORM by Gurudev Bhagwan who is none other than Bhagwan Ved. We bow to the AmshAvatar Ved Vyas Bhagwan , Badrayan and offer salutations at His feet. We accept our Bhagwan as His own form in Ved Vyas. In ancient days Bhagwan Ved Vyas brought the Vedas in a written form for the welfare of the world. He knew that Kaliyuga was fast approaching and man would become complacent and would not have the capacity to pass on this oral tradition by way of Shruti and Smriti ( Hearing from the Guru and remembering it and then passing it on to his disciple ). They would not be able to memorize the Vedas and keep it in their mind! He thought of doing something that would secure the teachings which would be for the welfare of all mankind. For our benefit he preserved the Vedas in a written form. All the four Vedas Rig, Yajur, Sam and Atharava were presented for the coming generations. Then our Sadgurudev compiled the four separate Vedas in the form of ONE book and presented it to us in a large ( Brihad ) form. 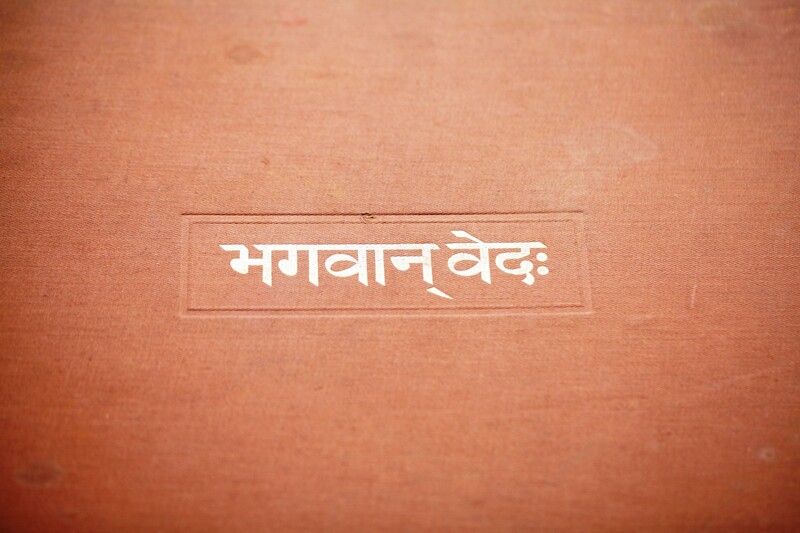 For centuries this oral tradition of the Vedas was available separately but Swamiji opened the doors for our welfare by this unparalleled contribution and gave the four VEDAS as ONE book form. The other religions have had the Darshan of their religious books but the lakhs and crores of Sanatan Dharmi brothers have never had the darshan of their VED BHAGWAN. We have heard of Vedas but have never seen! For the sake of darshan , all the four Vedas were put together in a the form of one book and animal fat free paper used for this Epic form which was printed and published thereby doing a great service for the coming generations! In Bharat from Kashmir to KanyaKumari, from Kutch to Cuttack, from Burma to Pakistan border, nearly 700 places in the country have been blessed with the consecration of Bhagwan Ved by Gurudev’s own hands. In nearly 125 places abroad the pure and holy form of this Book has been presented. To call you the modern Ved Vyas will not be wrong or out of place! You have done the work of Ved Vyas Bhagwan during your lifetime! I bow at the feet of this Ved Murti whom we are seeing in our lifetime .